Canadians are becoming concerned about the chemicals in regular cleaning products—and with good reason. Some of the ingredients in regular household cleaning products can be toxic and hazardous to our health. Ammonia, for example, is a common ingredient in glass cleaners but ammonia vapours can irritate the skin, throat, and eyes. Fortunately, there are plenty of eco-friendly and healthy green alternatives so we can breathe easy as we clean. 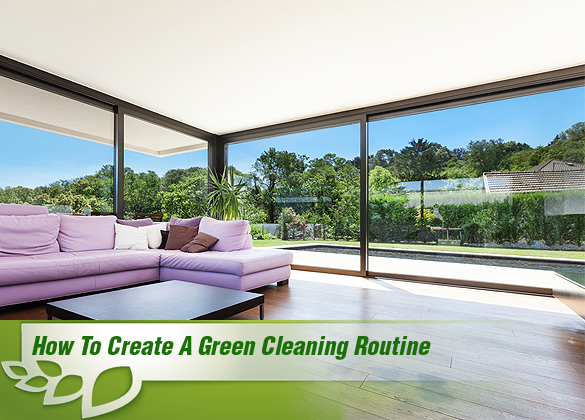 Here are some steps for maintaining a clean green home. A simple first step is to prevent bringing dirt and environmental toxins into your home: don’t wear outdoor shoes indoors. It’s not just the usual suspects of dog waste or mud, but particulate pollution and pollen can also be tracked onto your carpets and floors. This is especially important if you have young children who spend a lot of play time on the floor. And of course, ditching the dirt at the door makes your floors easier to clean. There are a variety of effective and eco friendly cleaning products on the market today—though make sure you read the labels. Avoid any products with MEA (monoethanalomine), DEA (diethanolamine), or TEA (triethanolamine). Make sure you don’t buy products with fragrance chemicals like phthalates, which can be irritants. You could even make your own green cleaning products. Warm water and vinegar, or warm water and baking soda make effective all-purpose cleaners. Add your favourite essential oils for a fresh scent, if you like. Baking soda is great for keeping carpets and rugs smelling fresh, too. Sprinkle some on, and then vacuum it—and the odours—away. Many buildings are so well-insulated that the air inside could be more toxic than the air outside, so ventilation is important when using cleaning chemicals. If possible, open the windows when cleaning to allow chemicals to flow outside. If you can’t, such as in a windowless bathroom, make sure you have the extractor fan on. If it’s not practical to open the windows, consider making your own air freshener instead of using chemical-based air fresheners. Simmering herbs like cloves or cinnamon produces a welcoming scent. Plants are also great for detoxing, as they filter interior air. By educating ourselves, reading the labels, and considering healthier, green alternatives, our homes can be both sparkling and safe.